Originally posted: August 14, 2017 . Last modified: December 15, 2018 . 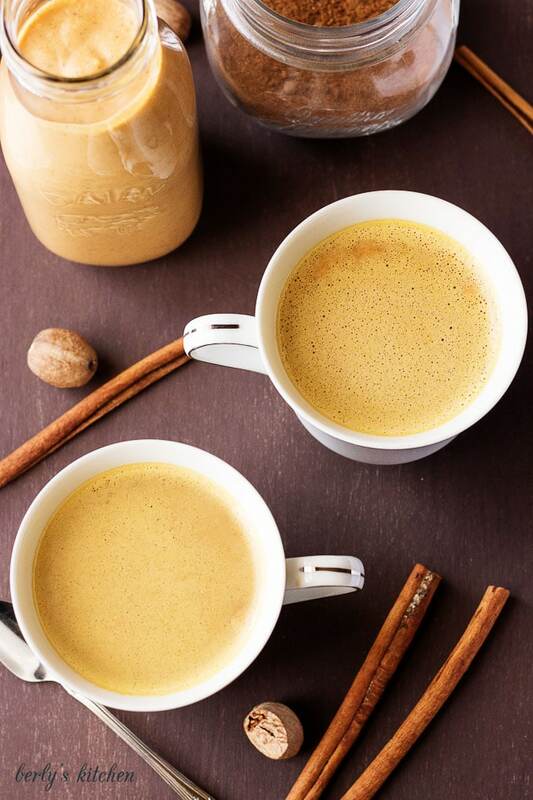 Our pumpkin spice latte creamer has all the seasonal flavors of your favorite coffee shop latte in the convenience of your own home. Fall is fast approaching, and we all know what that means, pumpkin recipes will be all the rave. Additionally, one of the most popular coffees will be available for a limited time. For those who are wondering which one I am talking about, it’s the pumpkin spice latte. I don’t recall when it first launched, but I can tell you, people love this drink. 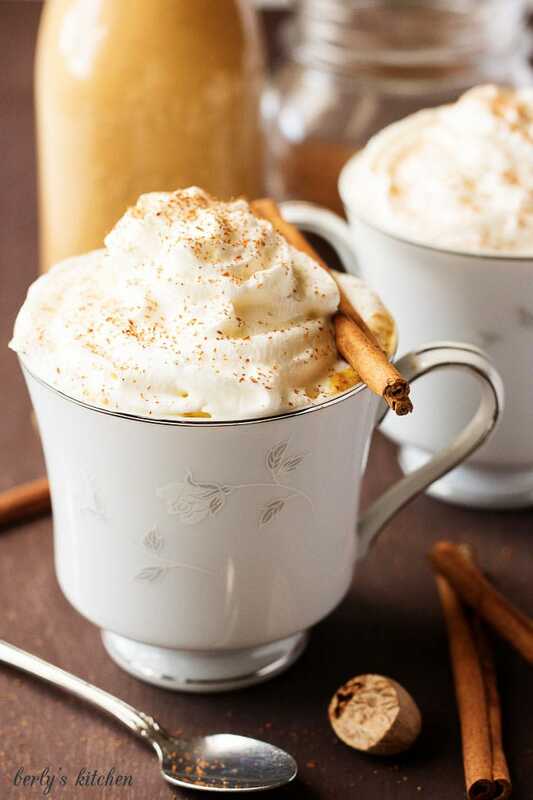 The pumpkin drinks fall right in line with other Fall favorites like our Instant Pot Hot Cocoa, Pumpkin Spice Spiked Hot Chocolate, and Hazelnut Hot Chocolate. Personally, I am not really a fan of the pumpkin spice latte; however, Kim drinks them like crazy. Furthermore, she’s always bummed when they stop selling them at our local coffee shop. Kim tried to make a recipe similar to this one last year, but it didn’t turn out. She decided against sharing it because she wasn’t happy with the final product. 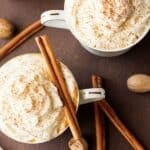 This year I decided to take a crack at making our version of the pumpkin spice latte. Since I’ve never worked in a coffee shop, I had no idea how this famous drink was prepared. With that being said, it would seem to me the most logical approach would be a spiced creamer. Simply take a heavy cream and start adding all the flavors of pumpkin pie. This apparently was the right the approach because Kim adored the first batch. 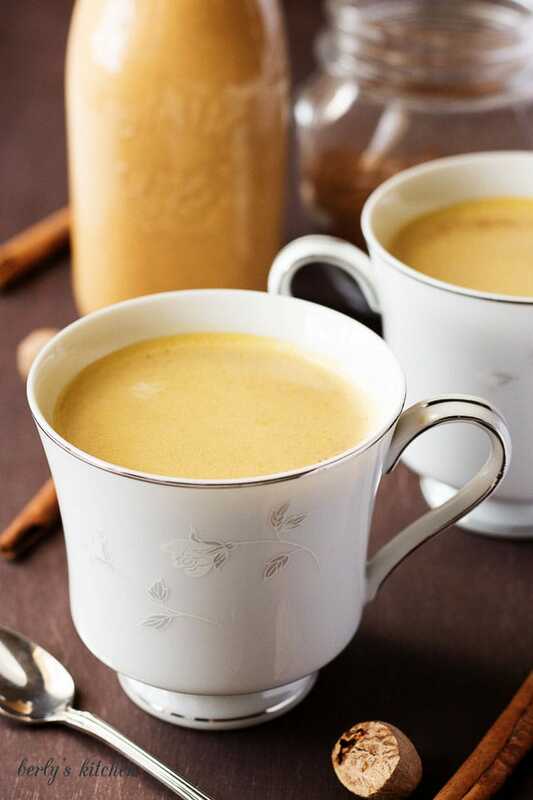 By spending just a few minutes with the blender, I came up with what Kim thinks is the perfect at-home pumpkin spice latte. I want to be transparent and admit, I did not try this drink, so you’ll have to take Kim’s word on how delicious it turned out to be. One thing is certain; it had to be pretty tasty because the batch disappeared in two days. The house smelled of espresso all day, every day until the creamer was all gone. In regards to flavor, it has all the classic pumpkin pie spices like cinnamon, nutmeg, and my favorite ginger. Before I go, I wanted to mention one thing. Once this pumpkin spice latte creamer sits in the fridge overnight, it gets thick due to the sweetened condensed milk. Make sure you shake it before each use. Also, you may not need as much creamer as Kim uses because technically we drink espresso and not coffee. So, a lighter roast may not need to have as much of the creamer. In closing, I wish everyone a long life, love everlasting, and a tummy full of flavored coffee! In a large blender or food processor, combine all the ingredients and blend them for about one minute. The mixture will be thick and creamy. Then place the creamer in a sealed container and store it in your fridge for up to five days. The calories listed are an approximation based on the ingredients in the recipe. This final mixture will make between 15 and 20 servings depending on how much you drink in your coffee. I recommend using equal parts creamer and coffee for the best flavor. Blend with frother until milk foams a bit. Put ice in it. Top with Redi-Whip and a sprinkle of cinnamon on the cream. Serve! They no longer have the first one I ordered. I just ordered this one: https://www.amazon.com/Nubeleaf-Organic-Pumpkin-Powder-14oz/dp/B06XH5SQX9/ref=sr_1_4_a_it?ie=UTF8&qid=1502808053&sr=8-4&keywords=pumpkin%2Bpowder&th=1 as I am almost out of the first 10 oz. You are like me, I dislike sweetened condensed milk. It’s much more natural to use a tiny bit of Stevia (it’s so sweet, though, so have to watch it!). You can make this as a creamer, too, to put in your latte. Oh! I just LOVE the after taste of pumpkin and I LOVE latte! Just like you, I get quite bummed when pumpkin goes away after the season is over but am happy that it’s coming back soon enough! Thanks for sharing this! I never thought of using a blender for this before! Now I’ve gotta try! This sounds so yummy! I love my coffee. One of the first major purchases my husband and I made was buying a nice espresso machine– after all, we met while I was working at a coffee shop. I can’t wait to make this creamer and have a lovely taste of fall in my latte! “tis the season!! Well not quite but we are getting close to the Pumpkin Spice season, my favorite season of all. I love Pumpkin Spice coffees so this creamer sounds pretty fantastic to me. And looks really easy to make too! My husband would like to try this. I am ready for pumpkin season, but for pumpkin treats! I have a Pumpkin Pie Smoothie that I make that is delicious. I will have to make it soon. Yes! Thank you for reminding me about pumpkin spice latte. It’s always all the rave during the fall season – and for good reason. I gotta try your recipe out and give it a go… I’m sure I’ll like it! My mom is always looking for flavored creamers. The traditional just doesn’t suit her anymore. She’ll enjoy receiving this homemade version from her favorite daughter! I gotta admit… I have never tried pumpkin spice. I know, it’s so weird!! And now that I’m reading through your post, I wanna kick myself for not digging into one yet. Thanks to you though, I can try making this on my own now. Thank you! This looks fantastic! I love anything pumpkin spice, I have always been a fan of that flavor and the season that comes with it. 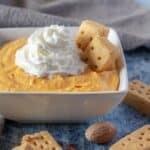 My family usually heads to the pumpkin farm this time of year so we will have to pick up some pumpkins and everything we need to make this recipe because it looks so yummy. I would love to have a cup of this right about now! I admit that I haven’t tried it much when I have seen it at other places like Starbucks. To be honest, I am surprised that I have not tried it out in the past because I do love pumpkin. This recipe here does sound so amazing and the pictures just make me want to go out and get one right this second. If you are a sweet coffee lover you have to try Vietnamese egg coffee which is a Hanoi tradition where my daughter lives. You whip an egg yolk and sweetened condensed milk into a meringue and drizzle over express to. So good! Hi, Analida! I’ve never heard of Vietnamese egg coffee. It sounds really good. Thanks for stopping by! Yummy! My sister and her kids love pumpkin spice lattes. Me, not so much. So, now I can wow them this weekend when they come to my house for brunch!! I can’t wait to make this for them!! This looks decadent. I think it would make for a wonderful gift around the holidays in a cute bottle. Thanks, Jenni! That’s a great idea! It would make a wonderful gift. 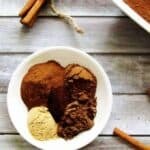 We hardly order pumpkin spice latte when we go to cafes but maybe if we make this creamer at home, we might give it a try! It looks good and decadent! I was never really into pumpkin, but now I love it and I’m so glad it’s pumpkin season! I love the idea of making creamer at home, one because it’s cost-effective and two you can add as much or little as you like. Oh my daughter has been trying to replicate Pumpkin Spiced Latte, I will definitely make some with her when she comes in town. She will be delighted! This is SO much better than the junk you get when you order from a store – this is a must! This looks amazing! I’m looking forward to trying this as I love pumpkin! What a perfectly fall looking drink!! The pictures are beautiful! I’m excited to try this one! Printing now! wow. This does look delicious. 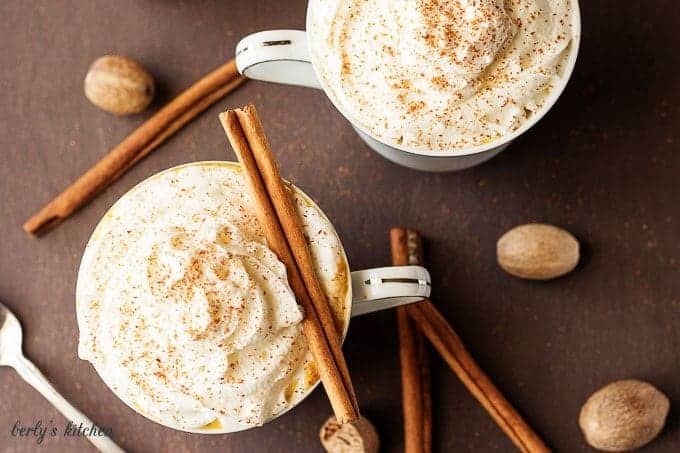 I’ve never tasted pumpkin latte but looking at the pictures am surely going to try this one.Thanks for sharing. İ am coffee lover and can’t wait to try this in my kitchen. Lovely presentation Kimberly and gorgeous pictures as well. Currently drinking this creamer in my coffee — ohmygosh. The creamer by itself tastes like pumpkin ice cream. This is insane. I seriously sipped the creamer before remembering I was drinking creamer and should really add it to my coffee. This is perfect.